Dental implants are one option for tooth replacement. 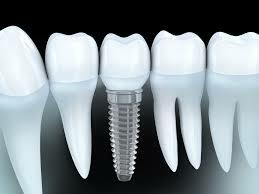 The implant is a screw-shaped device that fits into the bone where the prior tooth was located. In a process called osseointegration and through the coding on the implant, the body is essentially ‘tricked’ to hold onto that implant as it would hold onto a tooth root. Once osseointegration is complete, we place a crown on top of the tooth replacement, and it looks and functions as a real tooth. 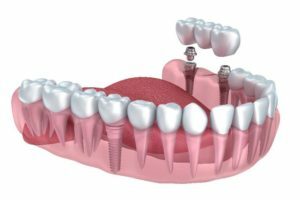 There are two parts to an implant: the screw-like portion that goes into the bone and the crown or tooth replacement piece. Dental implants are fixed, which means they do not come in and out as partials do. It is the most tooth-like option for a tooth replacement. An implant cannot decay as a real tooth can. Cost: A single implant costs approximately $4,000 start to finish. Time: The process of extracting the tooth, performing bone grafting, allowing the jaw to heal, and placing the dental implant can last up to six months. A partial or a bridge are two alternatives to a dental implant. Partial: A partial is a removable replacement for missing teeth. It is similar to a denture; however, it only replaces the missing teeth, whereas a denture replaces all the teeth in the mouth. A partial is also similar to a retainer as you can remove it, and it is usually made of acrylic or metal. The other teeth and the gums hold the partial in the mouth. Bridge: There are multiple types of bridges; the traditional bridge includes implementation of artificial teeth. Dental crowns cemented to the patient’s neighboring teeth hold the artificial teeth in place. Is bone grafting always needed prior to a dental implant? No, if the patient has enough adequate bone initially, the bone grafting may not be necessary. There are two different scenarios that require dental implants, and the procedure time varies with each. Takes six to eight weeks. For when there is not an existing tooth. This scenario takes about 6 to 8 weeks for the entire procedure, including placing the implant and the crown. This procedure could take longer if bone grafting is required to create a sufficient amount of bone in the jaw for supporting the placement of an implant. Takes three to six months. For when an existing tooth is being extracted and replaced with an implant. Typically, bone grafting will be required following the extraction of the tooth. The implementation of donor bone provides the adequate amount of bone for placement of the implant. This procedure requires more time for the body to heal and replace the donor bone with its own bone. Who is a good candidate for an implant? Individuals with overall healthy teeth are good candidates for receiving a dental implant. Patients with severe periodontal disease will face problems with implants; although the implants cannot decay, they can be subject to infections, such as those caused by the same bacteria that cause periodontal disease. Will insurance cover my dental implant? Insurance does generally cover a portion of the procedure, and this portion varies from one situation and insurance company to another.